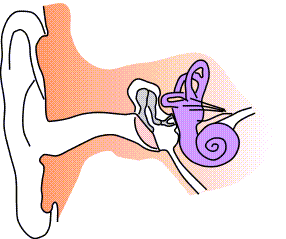 The two major functions that the inner ear performs are balance and hearing. The inner ear consists of what is known as balance fluid inside a small organ that is lined with very small hairs on the inside. These hairs are basically sensors that detect whether or not the fluid is touching them, and by analysing which hairs the fluid is touching, the brain can determine the tilt of the head. An infection of the inner ears throws off the function of these hairs, and thus the brain's perception of balance. This can affect anyone at any point in their lives. Dizziness is a fairly normal thing that is experienced by everyone at one point or another. Common causes include consuming too much alcohol or standing up too fast. Many different things can cause a feeling of dizziness, but when one experiences a specifically spinning feeling, it is usually due to inner ear dizziness, also called vertigo. Vertigo is usually caused by quick changes in the body's position and the length of the dizzy sensation. It is often accompanied by ringing in the ears or diminished hearing, lasting anywhere from 30 minutes to a full day. Vertigo can also be caused by various neurologic dysfunctions, medications or infections of the inner ear. Inner ear dizziness is diagnosed by conducting an ENG (electronystagmogram). This test helps determine the efficiency with which the brain, eye and inner ear interact to maintain balance while moving, and helps identify any possible tissue damage or nerve disconnection. The physician put electrodes on the forehead near the eyes to track eye movement as certain activities are carried out. Eye movement is also recorded as the eyes track a moving object and any abnormalities are analysed, as they will indicate an inner ear problem. There are many symptoms involved with vertigo that can be mistaken for other illnesses or afflictions. Such symptoms include ear pain, blurry vision, headaches, loss of short-term memory, bright light sensitivity, nausea, joint or muscle pain, anxiety, motion sickness, intolerance to temperature extremes, changes in air pressure, tiredness, tremors of the limbs, slurred speech and mood swings. To help alleviate some of the symptoms of vertigo, some steps can be taken. Drinking plenty of water and other fluids will help, as will reducing the amount of salt consumed. A consistent sleeping pattern is always healthy. Maintaining one's blood pressure or sugar levels (whether high or low) is the key in preventing dizziness or fainting. Continuing problems with inner ear dizziness can be cause for alarm and a doctor should be consulted immediately. The earlier these symptoms are recognised, the more easily the problem can be treated. Lightheaded And Dizzy. What Could It Be? Vertigo, strange feeling in eyes and inner ear Allergies? constant dizziness, neck pain, fatige, pressure in my ears, joint paint, bone pain. What are the symptoms of Menieres Disease? & How do I get tested?